Like many other photographers in the digital age, taking the photos is only half the story. Improvements can be made back home using Photoshop and Lightroom and recently there are a number of plug ins and filters available for these products to help your processing. But which ones to buy !!! I have been using Lightroom a lot recently and after purchasing Viveza 2 (which gets really good reviews), I started studying some of the information available on the internet to try and get the most out of the software. This book was recommended and it seemed worth trying at such a reasonable cost. I found it really useful to quickly learn the basics of the Viveza software, the different features are explained clearly in the first part of the book. The later part of the book contains example photos with step by step guides as to how to improve them (the photos are available for downloading). With the explanations at each stage I quickly found myself making adjustments and seeing the improvements in the photos with each change. Having learned how to use the software I am now making improvements to a number of my photos. 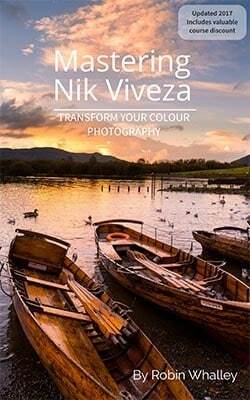 If you have the Nik Viveza software I really recommend this book to help you quickly get the best out of it. The Control Point tool and how this can be used to selectively target adjustments. You will also learn how to use multiple control points to make even more precise adjustments. The book also includes a valuable 75% discount for an accompanying Viveza video course. At the end of the book are four full length examples. These demonstrate how, starting with a basic image you can transform it into an impressive photograph. The examples are supported by high resolution files you can download from my website, allowing you to follow along on your own PC or Mac. The second edition of the book has been significantly expanded to include more examples and more in-depth information. Despite this, it retains the concise, hand on approach that made the first edition so popular. If you have ever struggled to make your images look the way you want them to, download Viveza and use this book.